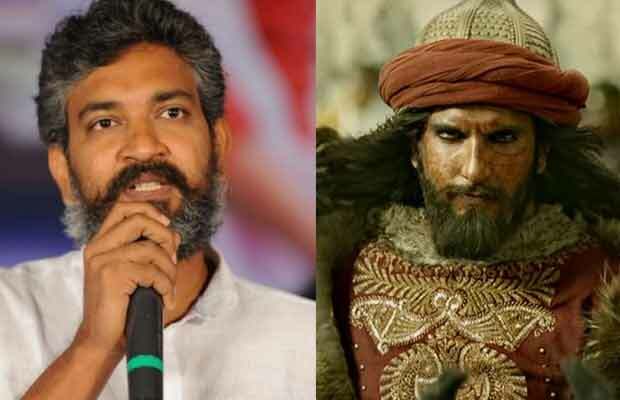 Baahubai fame SS Rajamouli finds Ranveer Singh menacing in the trailer of Padmavati! The period drama Padmavati’s trailer was released yesterday. And Sanjay Leela Bhansali’s film has stolen the attention from all over since the trailer of the film has been out. Such fierce war scenes, such spectacular portrayal of characters, such beautiful and magnificent sets, all these are enough to tell how grand the film is going to be. All the main leads, whether it is Deepika Padukone, Ranveer Singh or Shahid Kapoor, have left an impact on the audience. Even the Baahubali director SS Rajamouli could not stop himself from praising the film. But a special mention has to be given to Ranveer’s character of Alauddin Khilji. The actor has just nailed it and we can’t help us saying that it is probably his best performance ever! The audience has gone crazy seeing the spectacular performance that the actor has given. And so has SS Rajamouli who ‘can’t take his eyes off him’.
. @RanveerOfficial looks menacing and frightening yet can't take my eyes off him..
Padmavati’s trailer has left everyone restless for the film, which is to hit the theatres on December 1, this year. It is after much delay that the film will now be finally releasing! Previous articleBigg Boss 11: Vikas Gupta Breaks Down And Locks Himself In The Bathroom- Watch Video! Next articleBigg Boss 11: Vikas Gupta’s Brother Reveals That His Mother Is Getting Panic Attacks Because Of The Show!